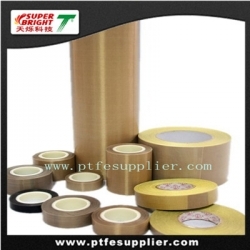 Standard PTFE Coated Fiberglass Tape –Silicone Adhesive Backing is made from a very tightly woven fiberglass cloth that has been coated with PTFE(polytetrafluoroethylene) and has a high-temperature, pressure-sensitive silicone adhesive applied to one side. It combines the excellent properties of PTFE and the excellent strength and dimensional stability of the fiberglass, has a lower bonding strength than acrylic adhesive, but a higher temperature range. It is our tapes' flagship product, created for industry's most demanding applications. Special requirment please contact our sales manager.